This is a MyLeague that includes most of the greatest teams in NBA history. My brother and I will be playing against eachother every game, we are very competitive. One of my favorite NBA teams of all time is the 06-07 Nuggets, his is the 07-08 Celtics, those are the teams we are using for the season. I'll show a list of teams in the league on a future post. But, these games will come with full highlights, and stat recaps. Watch the videos all the way through, I work hard on them. Some really good highlights happen in these games. 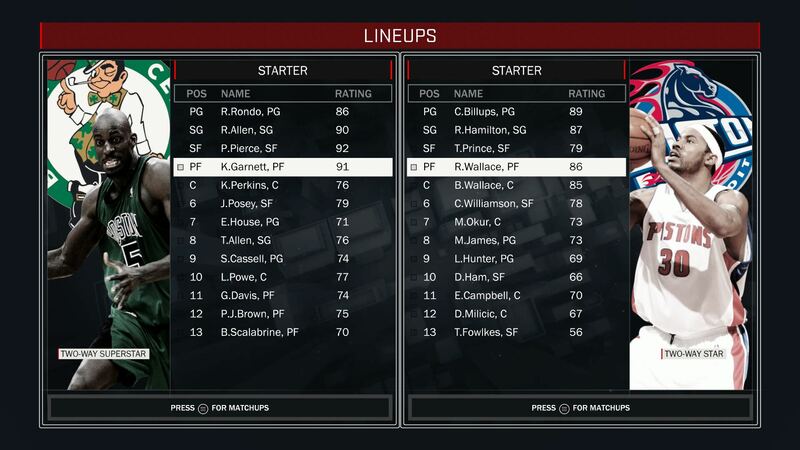 Some notables: Injuries are off in this MyLeague, why? 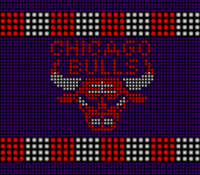 Because it's the greatest teams in NBA history, fully intact for the entire season. 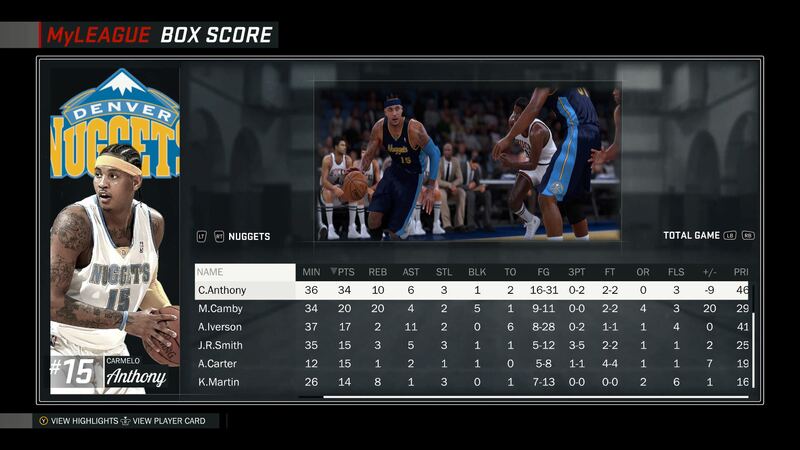 For example, Kenyon Martin for the 06-07 Nuggets only played 2 games in the 06-07 season, he will play 82 games for me. 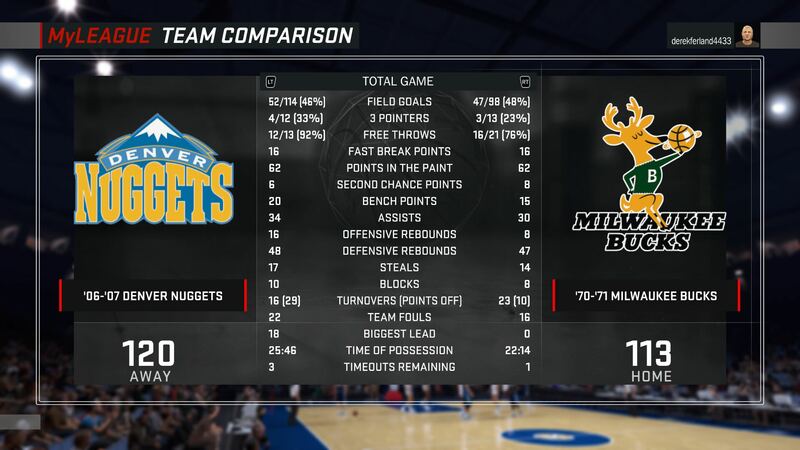 Also, sliders used is my own personal slider set, which has shooting between slightly higher than HOF difficulty, game speed at 55, and other misc tweaks. My goal is to make the playoffs... so many great teams, and my brother is very good at the game. Him and I are pretty even, so it will be interesting to see how the season pans out. 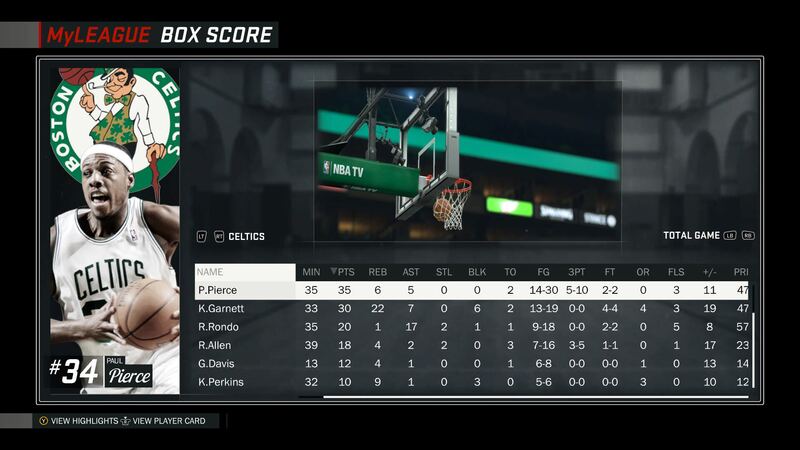 He has a superior team in using the 07-08 Celtics, so I will have a tough task taking them down. 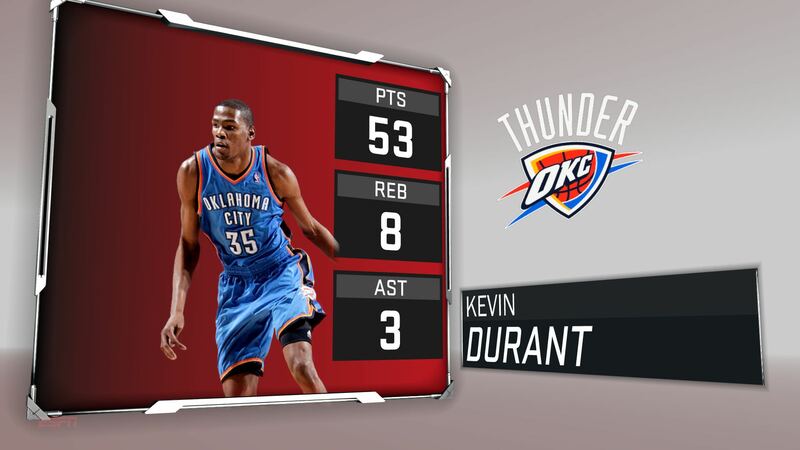 What a tough game... high scoring as expected. 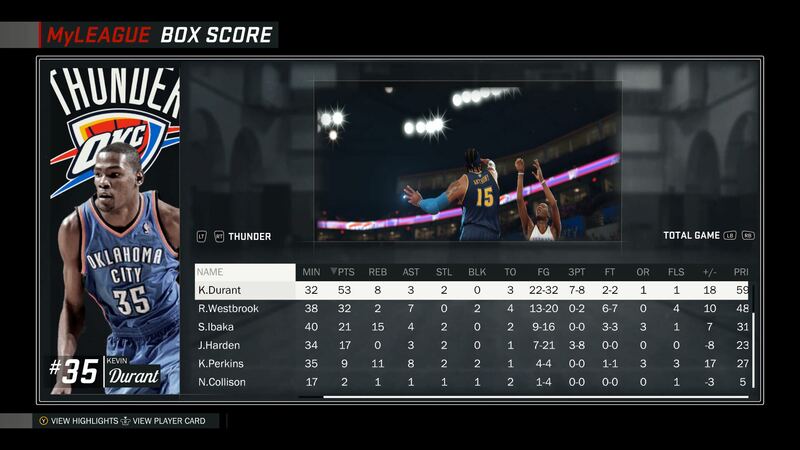 I had a really hard time keeping Westbrook in front of me, and I had no answer for Durant. 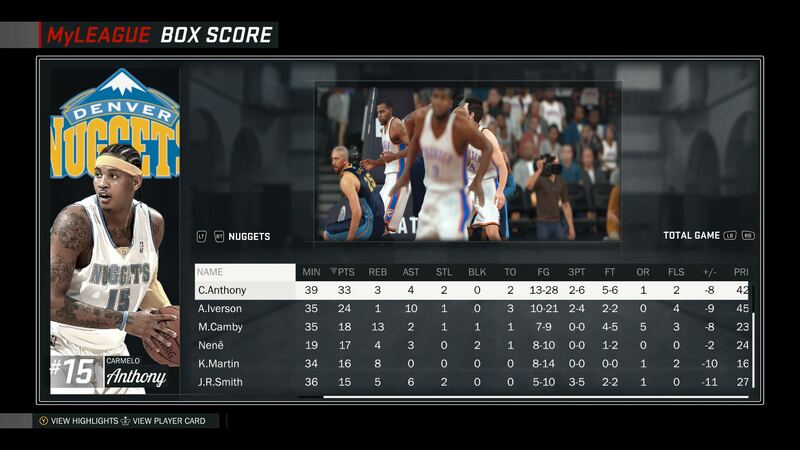 Missed a couple good looks at the end of the game with Iverson and Melo. Starting out the season 0-1 isn't ideal, but atleast it was a loss to the 11-12 Thunder. The 04-05 Suns literally couldn't hit from downtown, which is rare. 2-16 on three's. 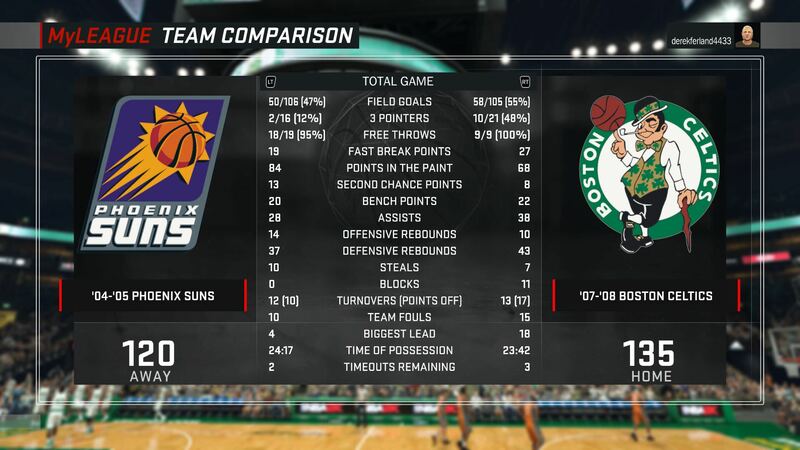 Garnett was an animal defensively down the stretch, combine the inability to hit three's and the inability to score inside, the Suns chances of winning was quite low. This places the Celtics at 1-0. *Note: The music at the beginning/end of the video is from past 2K games, some people enjoy the nostalgia aspect of having those songs implemented on the videos. If you would like to hear something different, let me know. Feedback is vital. 07-08 Celtics game 2 vs the 82-83 Spurs. Celtics are 1-0 coming into this one, but the 82-83 Spurs are no slouch. 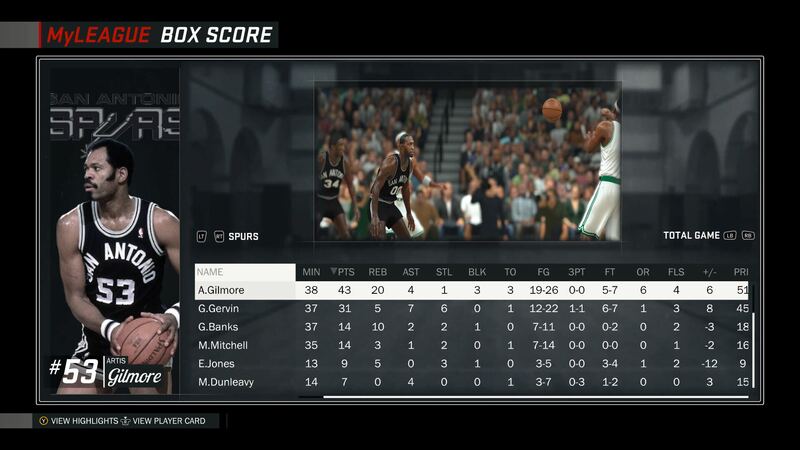 Gervin and Gilmore gave them all they could handle, including 43 points and 20 rebounds by Gilmore. Ray Allen was a scorching 8-10 from three, including two three's from around 30 feet away from the basket. 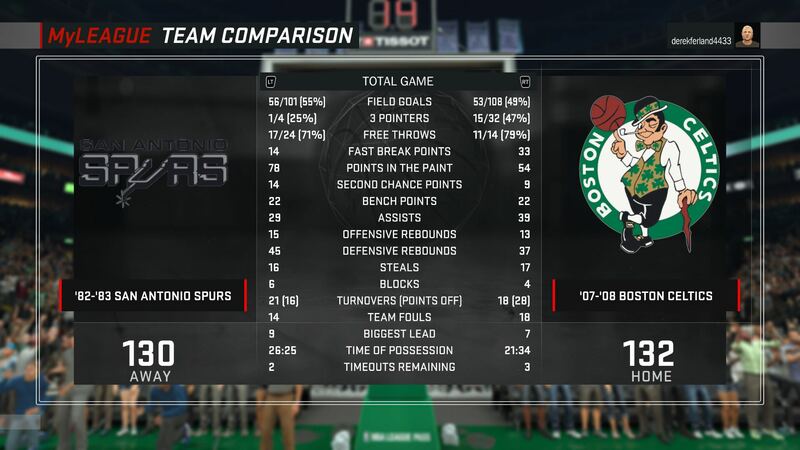 Celtics outside attack was a bit much for the 82-83 Spurs to handle, Celtics with the W.
This places the Celtics at 2-0. 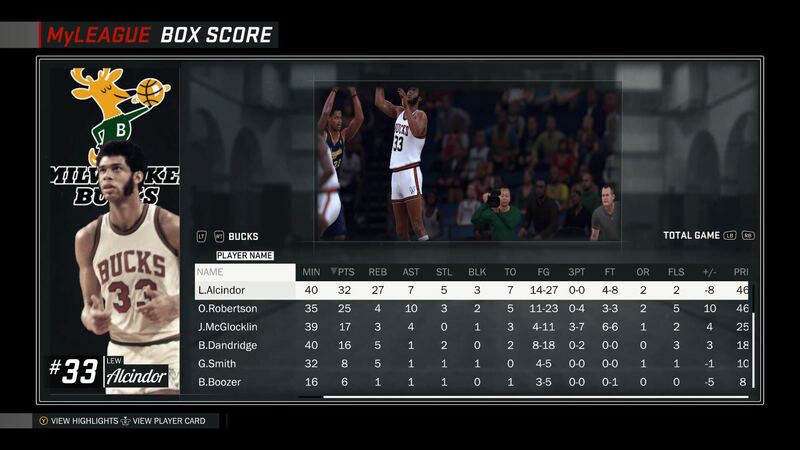 In a game where is felt like Lew Alcindor was contained, he put up 32 point and 27 rebounds. 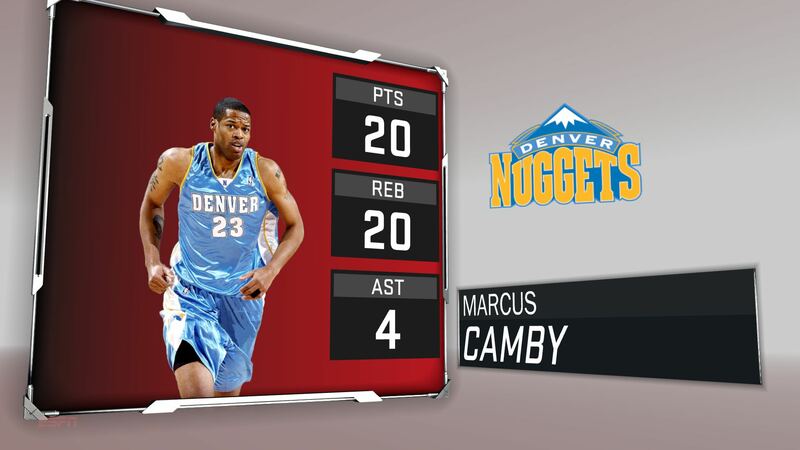 However, the 06-07 defensive player of the year Marcus Camby was no slouch, snatching the W and player of the game honors with 20 points and 20 rebounds. The Nuggets balanced attack (6 people in double figure) was too much for the Spurs to handle. This places the Nuggets at 1-1. The game was high in defense in the first period, but both teams caught fire from the field. 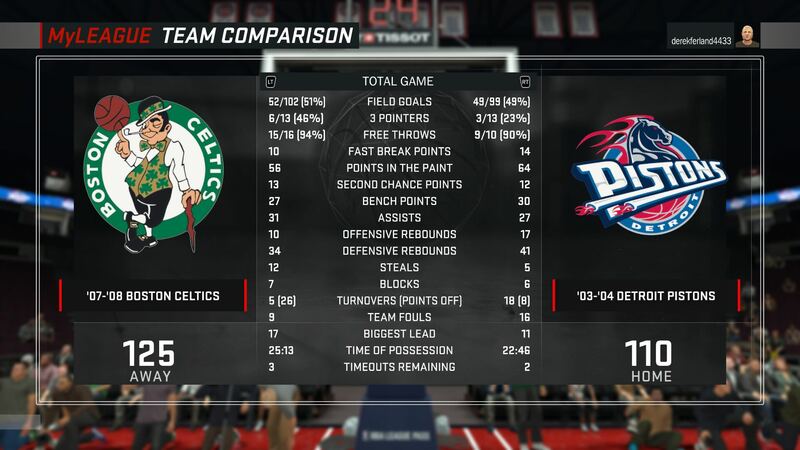 Key matchup of Garnett vs Sheed did not disappoint. 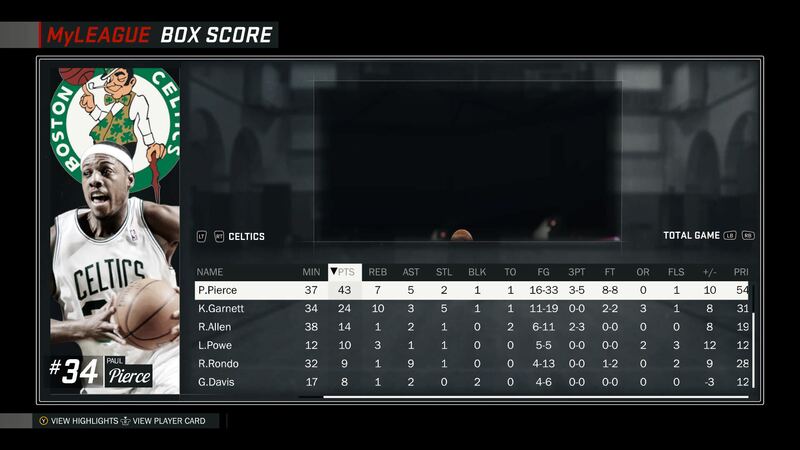 However, it was Pierce who was hitting off balance shots all over the floor that rattled the Pistons (And me, as I am the opponent). 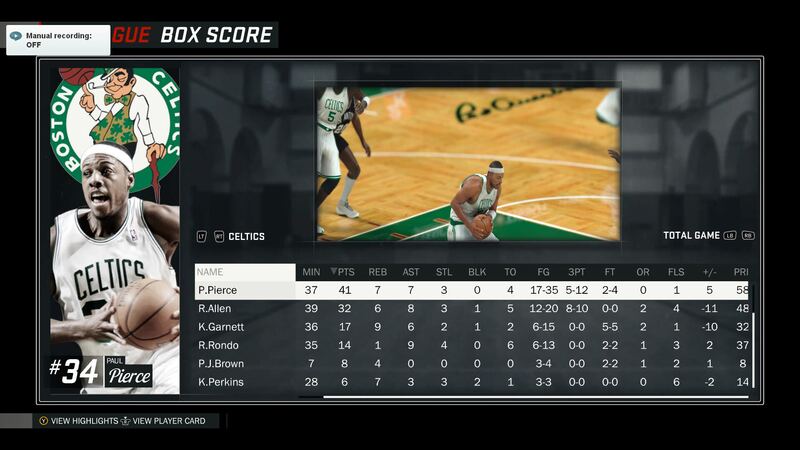 I couldn't seem to do anything about Pierce, he snagged player of the game honors with 43 points. 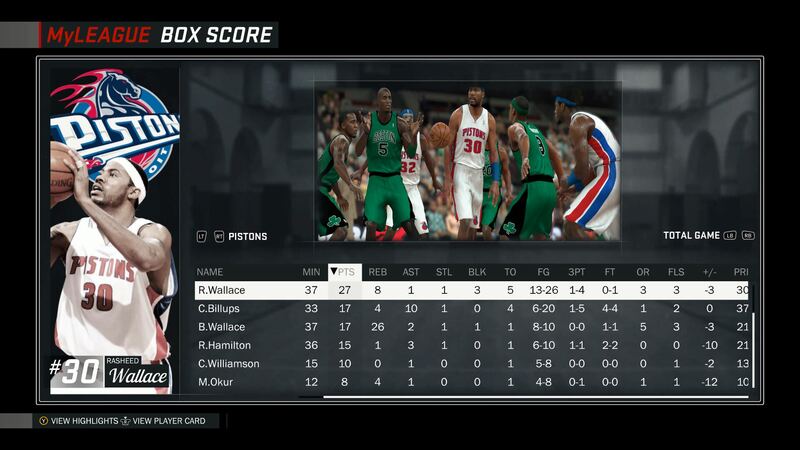 Ben Wallace had a monstrous 26 rebound game, but it wasn't enough. FYI - The 07-08 Celtics are 14 games in, and the 06-07 Nuggets are 12 games in. Ill be getting out highlights momentarily, bulk highlights in a couple different videos to show you what's been going on. To put it nicely, the Nuggets have been struggling (me), going through a rough schedule patch, and the Celtics are thriving. I'll also update the first post with a list of all the teams that are in this MyLeague, and update it with the current standings, players stats and league leaders. Sorry, I havn't posted in awhile here. 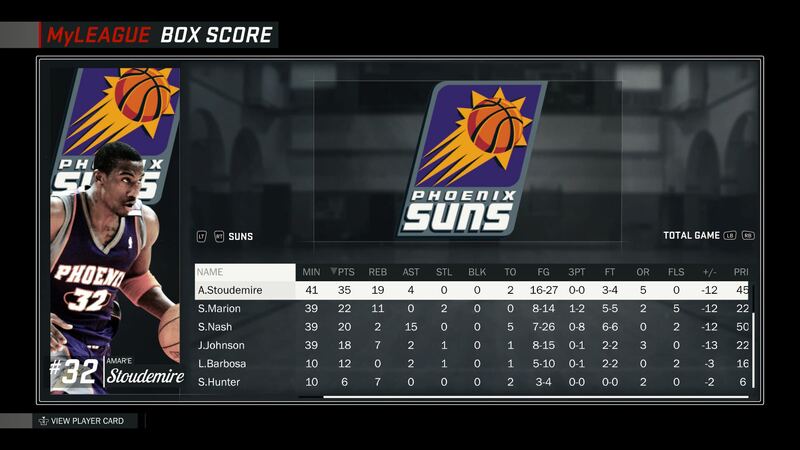 The MyLeague has been ongoing, and the last few games have been awesome. I had to post these videos here. Last week, the 07-08 Celtics took on the 05-06 Nets in New Jersey. The game went down to the wire in regulation, and despite my brothers efforts the double Carter in the 4th, he was too much to handle. I ended up coming away with the close victory. Last night, the rematch happened in Boston. The game went to OT, a lot of emotions involved. Him and I are super competitive, so we were getting really into this one. I worked pretty hard on the video today, hopefully you folks enjoy. Ill try to update this thread with all the teams included in the MyLeague, as well as updated standing/stats and videos. Just havn't hard the time as I have been embedded in PLAYING 2K17, as well as AOIT. Sounds like you're having a blast with it. I have to admit I've been leery of playing franchise modes this way; it's always sounded like a fun idea, but I find myself gravitating back towards real rosters (and then creating my own reality with them). Glad to hear it's working out for you! Andrew wrote: Sounds like you're having a blast with it. I have to admit I've been leery of playing franchise modes this way; it's always sounded like a fun idea, but I find myself gravitating back towards real rosters (and then creating my own reality with them). Glad to hear it's working out for you! Yeah it's not for everybody. However, the reason we do it is because we want all the legends in the game (On real teams that they were on) instead of having a fantasy draft roster or all time teams roster with players that the legends didn't actually play with. Because we do it this way, the "Star Power" of a team really matters. 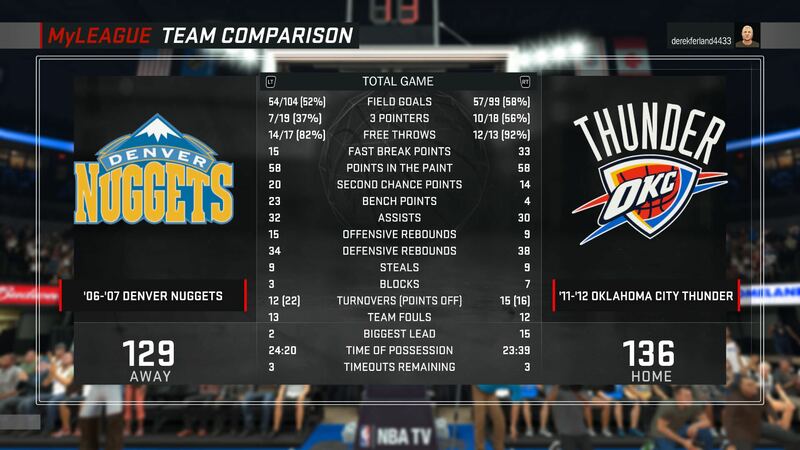 For example, I know that when I play the 11-12 Thunder, I have to deal with Durant/Harden/Westbrook, but when one, two, or all three are off the floor, I need to put my foot on the gas and try to take advantage of that opportunity. Absolutely. I think I personally get bogged down with the idea of a fantasy starting point being unrealistic, or too drastic of a change. It's the same reason I don't care to use the fantasy draft option, though it absolutely must be there for people who do find it appealing. I prefer to start with real rosters, and then let fantasy and fiction take over as it plays out, as I've found I've grown bored with outright fantasy approaches (or just can't get into them in the first place). As I said though, I do think they are fun ideas that I'm just too pedantic or set in my ways to enjoy, so it's cool to see it working out for you. I've still been quietly following this. I love those Carter Nets squads; those highlights were really enjoyable to watch.